Yesterday I allowed myself to be stuck with needles like a voodoo doll, and boy do I feel better! I have chronic pain and stiffness in my right shoulder. I've had it for years and years. Only recently did I realize that it probably was the result of playing the tenor saxophone in band from middle school through college. Hanging a 7lb weight around your neck for hours at a time and carrying a 24 lb case to school and back could definitely have some repercussions. Talk about suffering for your art. Regular visits to the chiropractor, occasional deep massage, and stretching regularly usually keep me in good health. But lately the pain has increased, and now my lower arm and elbow are acting up and my right hand goes to sleep if I don’t keep moving it. I rearranged my workstation. I shifted my pillows. I tried arnica gel and even resorted to ibuprofen, but I still couldn't get relief. Finally I made an appointment to get stuck in Summerville. With needles. On purpose. 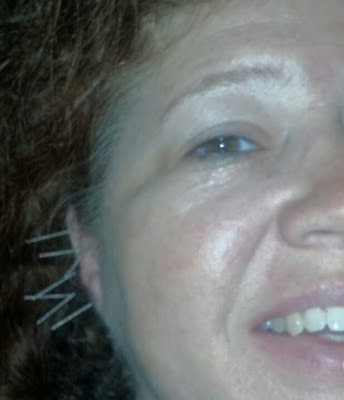 I first tried acupuncture last year to help with migraines. I am trying to minimize the number of questionable chemicals I put in my body in favor of more natural solutions. I had heard of acupuncture, but didn't know what it was like or if I could afford it. Then a doctor friend of mine recommended Mary Margaret Dobson and Allison Davis and their practice, Summerville Community Acupuncture. Not only are they trained and certified, they operate on a sliding-scale. They believe that acupuncture is such an amazing tool for healing that it should be available to everyone. Each patient pays whatever they can afford, between $15-$35, no questions asked. You never get a bill, never file insurance, never have to pull out a credit card. You just drop whatever cash you feel is appropriate in the box, then find a comfy recliner and wait on your therapist. That was a clincher for me. Having a word-of-mouth recommendation from someone I trusted, hearing that the acupuncturists were caring enough to make their service available and affordable, and knowing I wouldn’t have to tap into my grocery budget made acupuncture possible. It wasn’t at all what I expected. There was no funky Zen music playing, no choking incense, no weird idols. It was just a quiet storefront in the middle of a small Southern town with reclining lounge chairs and cozy blankets and a nice lady named Allison. She asked me what kind of problems I was having, explained what I might feel, and told me to relax and let her know if I had any questions. Ok, I could live with that. Because I already felt better. Fast-forward to this week. I went at 9:10 am on a weekday and there were already two people in chairs. Both were probably in their late 50s or 60s. The lady was already napping peacefully under her blanket while therapist Mary Margaret treated the gentleman who was wearing a brace on one leg. They chatted quietly while I settled into a recliner. While she worked, Mary Margaret shared a little about that their practice was part of a national community co-op. She said they get a lot of criticism from other therapists in the field who accuse them of “cheapening” the product by offering it so affordably. They hold that, if people valued their health, they should find the money to pay the going rate for treatments. At this, she shook her head. As usual when I am lying still, my brain started working overtime. Story ideas started pouring into my mind, and I realized that this experience was an excellent topic that might interest and help someone out there. Of course, a picture is worth a thousand words, and I usually use both. I carefully reached into my purse for my phone and snapped a picture of my ear. You can't get this look at Claire's in the mall. After I took this picture, another older lady made her way into the room. I could tell she was a regular, because she grabbed her blanket and pillow, found her chair, and knew just where to put her things while she waited on Mary Margaret to treat her. Normally I wouldn't strike up a conversation in an environment like this, but I wondered why she was here. “You look like you know the drill,” I commented. She smiled. “I guess I do. I've been coming three times a week for the past three weeks. I have fibromyalgia,” she said. Mary Margaret then came over to treat her. I heard her wince a little when her right leg was being treated, but she commented that it was better than before. I looked over briefly to see her face go from tense to relaxed as the treatment started to bring her some relief. When my treatment was done, I told her I was going to write a story about acupuncture and asked if I could share her story. She smiled and said yes. Her attitude was that if just one person decided to try acupuncture and found relief and healing in it, then that was a good thing in her book. The gentleman with the brace stood carefully. He turned to us with a broad smile and wished us all a blessed day, then walked slowly towards the exit. So there’s our story. A group of ordinary people looking for help. Another ordinary person with special training in healing who wants to share her gift freely. A roomful of ordinary people smiling at each other, sharing stories, and giving blessings as they go forth to their ordinary day. I would say that is anything but ordinary. And I would say that Summerville “Community” Acupuncture is aptly named. In the Charleston SC area and interested in acupuncture? Visit Allison or Mary Margaret at Summerville Community Acupuncture and tell them Cindi sent you. For the month of August, “Like” their Facebook page and have a treatment for $10. Acupuncturists Toronto is thousands of years old, and yet it's also on the forefront of change in modern times. Healthcare is broken and we need better ways to care for ourselves. Take care of yourself and enjoy life.